What are the Pros of Implementing HTTPS? There was a study conducted by the Peter J. Meyers of Moz revealing that “30% of Page-1 Google Results were secure HTTPS”. Shocking?Hardly! This spike in the HTTPS sites is a result of Google’s tirade stating that HTTPS is a favorable ranking factor and will be given preference over HTTP. Well, this particular statistic has grabbed a lot of attention since then and has given rise to one question in general, what are the advantages do HTTPS web services provide websites with that it was given so much weight in Google’s ranking algorithm. But first, let’s understand what HTTPS is? HTTPs, fully formed, Hypertext Transfer Protocol Secure, is a protocol that employs HTTP on a secure, encrypted and transport-layer security environment. HTTPs connection is used to encrypt connections to and from a site so that they can’t be accessed by any third-party invader. Now, it will be next to impossible for anyone to access data that flows between your site and the visitor. It is used to protect the transmitted transaction from going out. They are generally used for carrying out financial transactions and to protect website’s user from any kind of censorship by the government. The HTTP secured website’s URL begins with https:// and you will see a lock sign ensuring that you are navigating in a secured, protected environment. 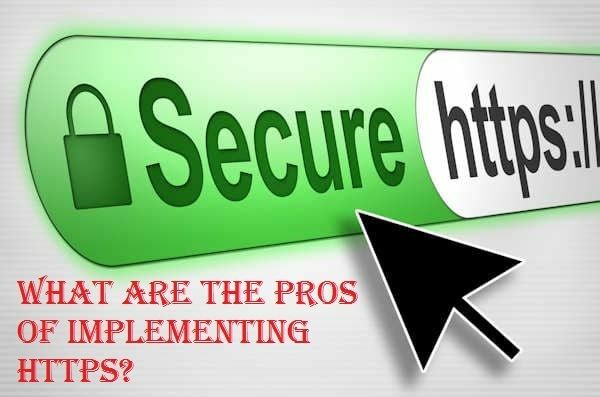 Now, let’s study the various pros of implementing HTTPS as listed by a reputable Web Development Company in Phoenix Arizona AZ. Privacy: HTTPs plays a function of identity verification very efficiently. One of the major advantages of implementing HTTPs is that it ensures the website users that the website they are visiting isn’t a scam and they are who they are showing. HTTPs connection verifies your website on the server it is meant to be connecting to, so the visitors will have a piece of mind that they are in a secure environment. Security: If the interaction between a browser and server is happening in the clear, it’s not rocket science that a third party site can easily access and alter the data transmitted between them. By taking over or in more understandable terms hijacking a connection, the third party site can easily alter the data sent from the server before it can finally reach the browser. Google and SEO: Google wants only the best for their visitors. They want their visitors to visit only a secured and protected websites and, HTTPs fulfill the criteria. That’s why it is one of the favorable Google ranking factors. There has been a significant hike in the number of HTTPs site in the Google rankings. Author AdminPosted on October 16, 2017 October 16, 2017 Categories SEOTags Implementing HTTPSLeave a comment on What are the Pros of Implementing HTTPS?